Imagine it is Christmas of Next Year and you are looking back on 2015, a big grin on your face. It has been a marvelous year, filled with firsts for you in your practice and you and your family ... outside of work. What is driving your sense of satisfaction. What are the successes of 2014 you have been able to build on? What have you changed / accomplished / experienced / let go of? 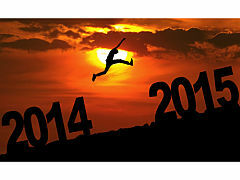 Exactly what would it take to make 2015 YOUR Best Year Yet? 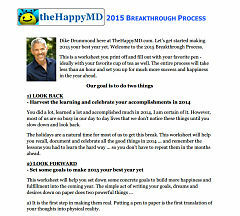 Let’s make it a year of breakthrough success, happiness and satisfaction … both in your practice and in your larger life. What do you say? Here is the 2015 Breakthrough Planning Process. Your experience of 2015 depends on setting and keeping specific intentions and goals for the year. To get what you want, you have to slow down and figure out what that is. We invite you to invest an hour in getting clear on your ideal vision for 2015 using specially worded questions designed to help you focus and prioritize. Take some time to put YOU first. Here is TheHappyMD.com 2015 Breakthrough Planning Process specifically designed to help you breakthrough in those areas where you are feeling stuck – at work or home. These 10 highly focused questions only take a relaxed hour yet can make a massive difference in your quality of life in the 12 months ahead. Ready? This year has been an incredible ride for TheHappyMD.com with over 5000 doctors joining our community from 63 nations around the world. I am committed to 2015 being my best year yet and invite you to join me in creating that for yourself in the next 12 months. Click Here if you have ANY questions or suggestions about this process or any of the other ways we can support you having your best year yet in 2015. PLEASE LEAVE A COMMENT with one of your top goals or adventures for 2015, so we can cheer you on.